Bowling Green not only has more restaurants per population than any other city in America, but it has great restaurants within an hour drive and some of America's most beautiful country to drive through on the way there and back. 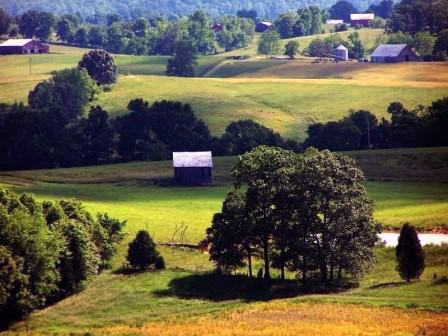 In every direction from Bowling Green you enter a still rural landscape of old barns, antebellum mansions, Amish farms, quiet rivers and grazing livestock. 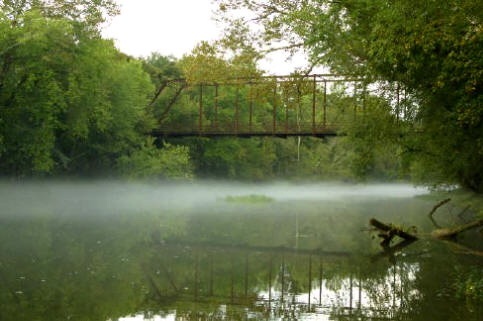 Some of the nation's greatest state parks, small towns and scenic byways dot this region. And, nestled amid this photogenic countryside is a great collection of restaurants. The Sunday drive, often after Church, is alive and well here. 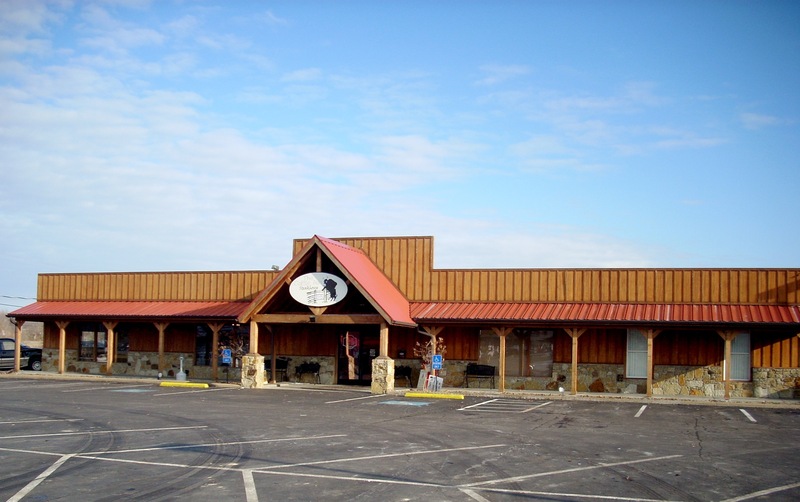 Tony York's is the best restaurant within an hour of Bowling Green and one of Kentucky's Top 10. It's in the old 1883 depot in Glendale, a village just off I-65 11 miles south of Elizabethtown. 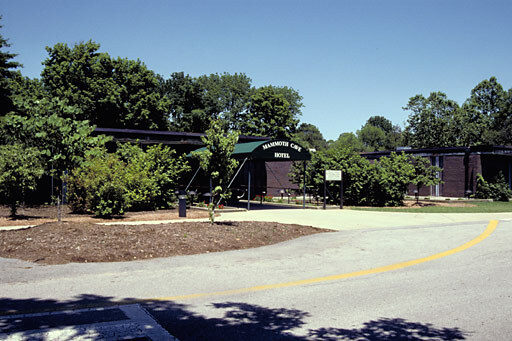 It burned to the ground in 1931 and 2008, so even though it's been rebuilt each time to match the original, this is no longer a historic building. Tony York has recruited a trio of young chefs : Kir Hollenbach, Jennifer Horn and Christina Evans. One of their Signature dishes is their Jager Schnitzel (veal cutlet pounded thin, then fried in a milk and mushroom gravy and served on a bed of green beans), which they serve only for lunch Saturday. We review German specialty restaurants in major cities and this Jager Schnitzel is competitive with any of them. Lunchtime appetizers include Fried Green Tomatoes, Country Ham Cheese Grits (with blackened shrimp), and Pork Pot Stickers. Of their lunch Soups, the Potato Cheddar is good, but the Tomato Basil is one of the better versions in the state. Their Candied Apple Sugared Pecan Salad is outstanding, but there's also a Classic Greek and Caesar. Lunch Entrees include Ribeye, Chicken Marsala, Salmon and Veal Parmesan, but we think their best are their Hot Brown, Sorghum Dijon Pork Loin and the Herb Stuffed Quail. The Quail alone is worth the drive to Glendale. Lunch Specials include Country Ham With Red Eye Gravy, Spinach Lasagna (quesadilla style with six stuffed triangles), and Southern Fried Chicken With Milk Gravy. Dinner Appetizers include Calamari, Fried Mushrooms and Chicken Livers, but the Signature item is Country Ham Sweet Potato Crumpets. They brew new Soups for Dinner : Seafood Bisque and Vegetable Beef. Both are delicious. Entrees are New York Strip, Filet Napolean (seared, glazed, smothered in mushrooms), Lobster, Lamb Chops, Veal Piccata, Chicken Marsala, Seafood Platter (fish, shrimp, scallops, clams, oysters), Shrimp Cheese Grits, Salmon, Grouper Diablo With Country Ham & Shrimp, and Scallops & Shrimp. Specials on a rotating basis are Tilapia, Shrimp and Pasta Alfredo. Hardin County is Dry. York's operates as a supper club, meaning you buy a membership and are then allowed to bring your own bottle of wine to dinner. Membership fees are $1 per meal per group, or $25 per year. 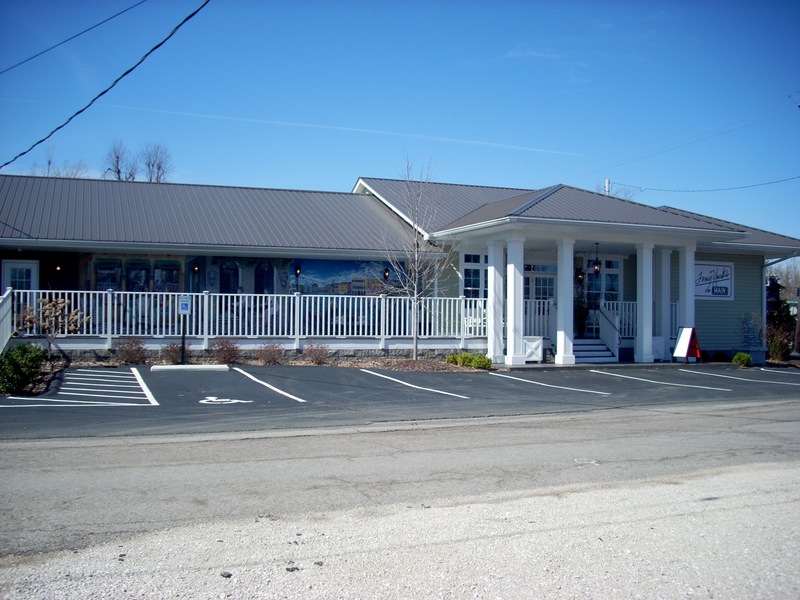 Walk ups can get a lunch table, but reservations are needed for dinner (270-369-6000). The art hanging on the walls and the pottery pieces sitting on various surfaces are created by locals and is for sale. York's is interesting in that it was never a residence, but after the 2008 fire they redecorated it as a fine country home. Even the kitchen, rather than the usual stainless steel modern look, has been built with the white wooden cupboards and other touches from Grandma's 1900 kitchen, although obviously quite a bit bigger. 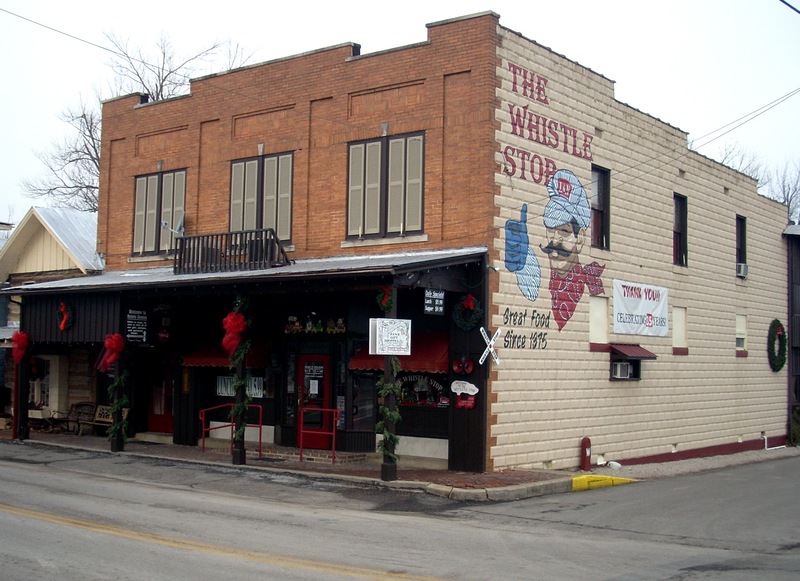 Whistle Stop is also in Glendale, right across the tracks from York's. 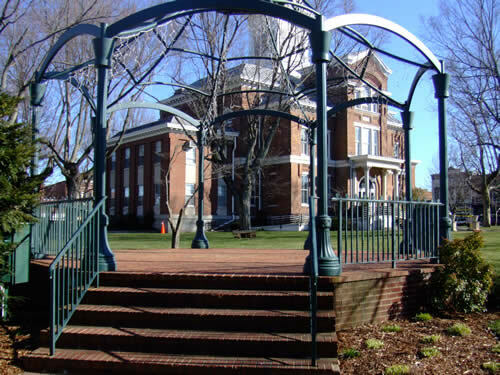 The usual strategy is to combine an afternoon of antique hunting and Christmas gift shopping with lunch at Whistle Stop and dinner at York's, since Main Street has been redeveloped as a boutique shopping center. For almost 40 years Whistle Stop has specialized in comfort foods, beginning with Okra, Dill Pickles or Fried Green Tomatoes. Then there are Bean, Broccoli Cheese, or French Onion Soup. They offer five salads, of which we like the Mandarin Orange. Entrees include Baked Whitefish, Roast Beef, Catfish, Country Fried Steak and Country Ham, but the one they're famous for is Meat Loaf. The beverage list includes spiced tea, buttermilk, pink lemonade and a great cup of coffee. They rotate desserts on a daily basis. On a Saturday, try to eat here before noon. From noon til 3 you'll face an hour wait. Barren River Lodge looks out over Barren River Lake just South of Glasgow in Barren River State Park. 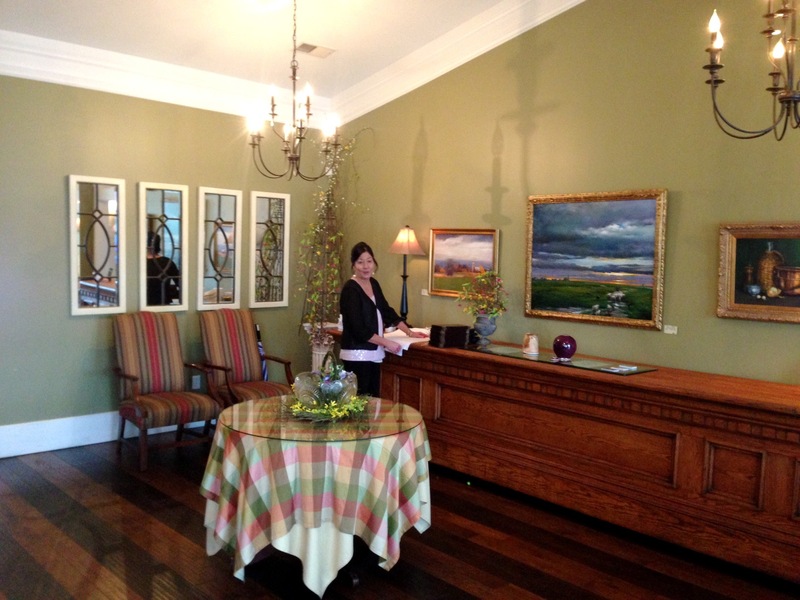 The lodge is very beautiful and well kept and contains an excellent restaurant. They are known for their great Sunday buffets and their Fried Chicken, Catfish and Desserts. But their real culinary fame is Buffalo Night three times a year featuring various Bison dishes : BBQ Buffalo Brisket, Buffalo Stew, Buffalo Chili, Buffalo Meatloaf, and a Carved Steamship Round of Buffalo. Big Moose BBQ Smokehouse doesn't serve moose, but they do serve excellent barbeque. Their signature item is their Dry Rubbed Pork Shoulder but the Barbequed Chicken is also outstanding. The secret here is their vinegar based barbeque sauce, which adds a certain bite. Another reason for their growing popularity is their sides. The Coleslaw is also made with a vinegar base and is so outstanding people take plastic containers of it home. They add onions into their Hush Puppies, an unusual taste but a very good one. The other great side is the Candied Sweet Potatoes, one of the best renditions of this Southern Kentucky favorite in this area. The beverage list begins with a fine Sweet Tea, but they've got just about anything you might like to drink. Save room for dessert so you can try some of their very moist and creamy Chess Cake. Sadly, the Big Moose is not open Sundays, so you can't drive over to Glasgow after church. And you have to avoid the lunch hours during the week because of the crowds. So you'll have to go over some Saturday or perhaps a weeknight evening. But if you appreciate fine barbeque, this is very definitely worth the drive. Mammoth Cave Lodge is run by a national corporation that bids for a cluster of lodges at a dozen parks (Isle Royale, Shenandoah, etc.). The menu is standard at all of them, but since this is the only one in Kentucky, that doesn't matter. There are actually two eateries here : The Crystal Coffee Shop and the Travertine Restaurant. The Coffee Shop serves mainly fast food, although it's better than average at burgers and fries. But the Travertine is what you drive out for, and you may want to do so, because this 1960 lodge is about to be replaced with a newer, Western style lodge with a new restaurant. The one there now has a limited but very good menu. Their signature items are their Southern Fried Chicken, Rainbow Trout, Biscuits, Cherry Preserves, and very good Coffee with unlimited refills. Other popular items are Catfish, Country Fried Steak, Ribeye and Pork Chops. The best of the desserts are their Pies, which change seasonally. The drive into the park is especially scenic in the Fall when leaves are in full color. This is really one of the best restaurants in the area, as long as you can overlook the limited menu and limited hours. They close early each evening, so this has to be a day trip. 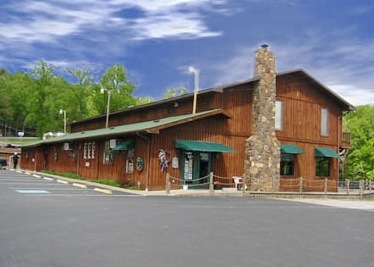 Shady Cliff Resort is a little further drive but it's a great Saturday or Sunday excursion out through rural Kentucky to Lake Malone State Park on the Logan - Muhlenberg County line. Go to Russellville, then turn right and go up through Lewisburg until you see the left turn signs for the resort. You get to eat an early dinner while looking out over the lake and surrounding hills. This is an especially beautiful trip in Spring or Fall. Among their appetizers, we like the Blooming Onion and Fried Pickles. The Carolina Shrimp Pecan Salad is a great way to start a meal. 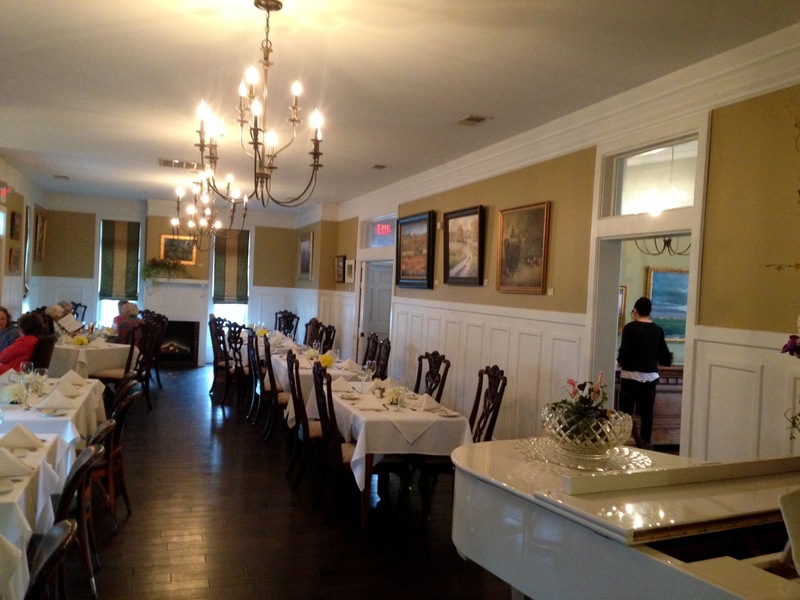 Their signature entrees are their Catfish Fiddlers and various Southern fish. But the Smoked Pork Chop and Country Ham are close seconds. You need to split your desserts and pass around. Somebody has to order the Sawdust Pie, somebody the Peanut Butter Pie and somebody else the Boat Sinker. There's also a dinner cruise on their specially equipped boat. You cruise the entire length of Lake Malone and back while eating basically the same food served at the restaurant. This is the only dinner cruise within a short drive of Bowling Green. 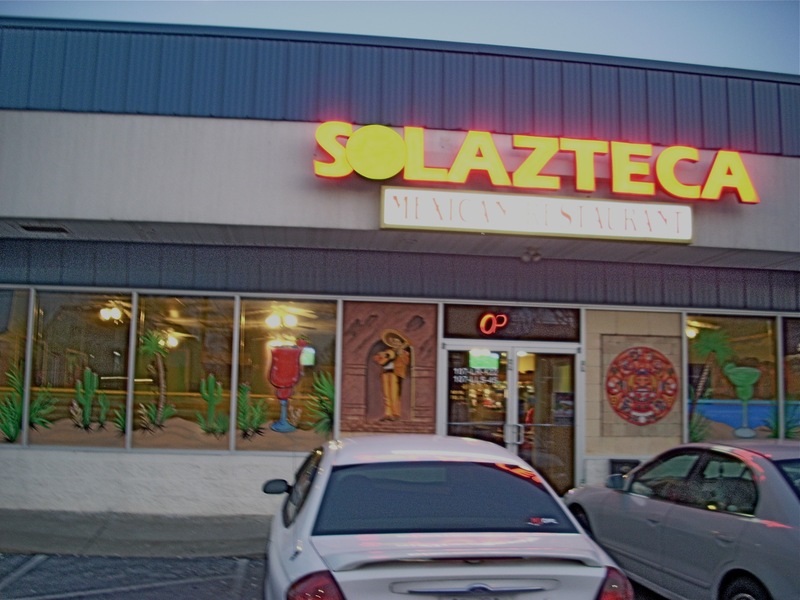 SolAzteca has locations in both Franklin and Russellville and is one of the better restaurants in both towns. They make a big deal out of Lunch, in a successful attempt to bring in the downtown workers on their breaks. There are two whole menu sections of lunch specialties, plus appetizers, salads and side orders. They also offer a nine item Child's Menu plus five Child's Sides. There are 30 Combination Dinners and five Steak specialties. We really like their Quesadilla Tropicana (grilled chicken, steak, shrimp, pineapple chunks, cheese, lettuce, tomato and sour cream in a flour tortilla) and Fajita Del Mar (grilled scallops, tilapia, shrimp, onions, peppers, tomatoes, lettuce, pico de gallo, guacamole, sour cream, rice and beans with either a corn or flour tortilla). Every Mexican restaurant in America features a Chimchanga, but we think SolAzteca does as fine a job with theirs as we've tasted anywhere. SolAzteca has the usual Mexican desserts, but they add one not seen elsewhere : Burrito Banana (burrito filled with banana, ice cream, whipped cream, sprinkles, cinnamon and chocolate syrup). We've tried this concoction, and if you plan to order it, you need to scale back on your entree, or you won't be able to eat again for two days. 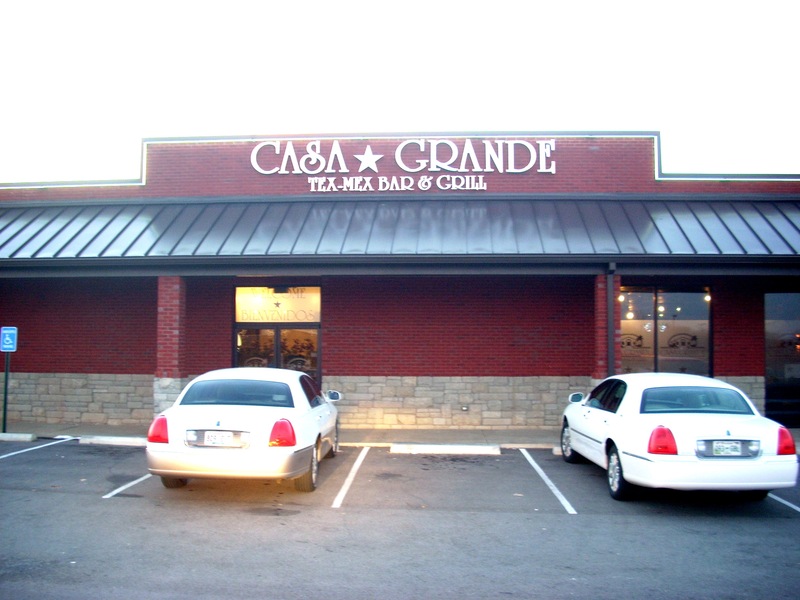 Casa Grande is the Franklin outpost of the Bowling Green Peppers franchise. Don't let the modest exterior deter you---once inside, this is a good enough restaurant that employees of BG Mexican restaurants, even Peppers, privately admit this is where they come when they go out for Mexican food. One reason for this is their extensive Seafood section. Much of it is Shrimp fixed various ways with various sauces but there are also Scallops, Tilapia and other favorites. You can order yours fried, steamed, sauteed, or grilled. Several of our staff like their Seafood Fajitas (shrimp, scallops and tilapia), which are not offered by very many Mexican restaurants. If you're not into seafood, they fix a fine Chiles Poblanos. If you want something a little unusual, try the Moicajete (shrimp, chicken, steak, sausage, green peppers, onions, tomatoes, cheeses, beans and rice), a delicious mix you wrap in soft tortillas or eat right off the plate like a sort of Mexican Paella. However, before you order your entree, there's a great Chicken Tortilla Soup which we consider the best of their appetizers. If you're especially hungry they've got some Casa Grande Specialties, like the Primo Combo (chicken tamale, chicken chimichanga, beef taco, beef burrito, chile relleno, cheese enchilada, sour cream, pico de gallo and guacamole). There's a special lunch menu. Since Jake Simic and Robert Stupar opened The Brickyard in 2005, it has become THE upscale facility of Franklin, the place businessmen take clients and locals celebrate special occasions. Even if you're a regular customer of their original Brickyard in downtown BG, this is still worth the drive out just to see the building. Since 1903, this was the Franklin Carriage Company, Hatter Hardware and most recently PJs General Store. They've kept traces of all those former owners, most spectacularly the hoist which lifted carriages to the second floor for servicing. 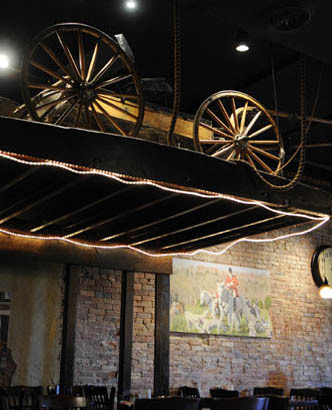 You can eat under or near the lift, which sits in raised position complete with antique carriage (left). You can take a look at the 8000 pound Diebold Safe or admire the 107 year old plank floors or the locally made Ford bricks. However, the food still justifies the trip. This is an eclectic mix of Bosnian Croatian Italian Greek American. Of the appetizers, we especially like the Artichoke Fritters (fried artichokes with garlic aioli and marinari) and the Eggplant Tower (stuffed with ricotto and red peppers). They've studied Kentucky cooking and offer Catfish, Pot Roast and Hot Brown, all of which are excellent renditions of these down home dishes. For Italian lovers, the Spaghetti, Lasagna and Chicken Canneloni rival anything at a top Italian restaurant. Their Ribeye and N.Y. Strip steaks are great, as are the Eggplant Parmigiana and Chicken Saltimbocca. They're not open on Sunday, so this is not an after church drive, but it's a great Friday or Saturday night break from the city. We highly recommend driving down 31W. It's a lot more scenic than the interstate and The Brickyard is just to your left on 31W as you come through downtown Franklin. Bring your camera; the inside of this place is worth a few photos. 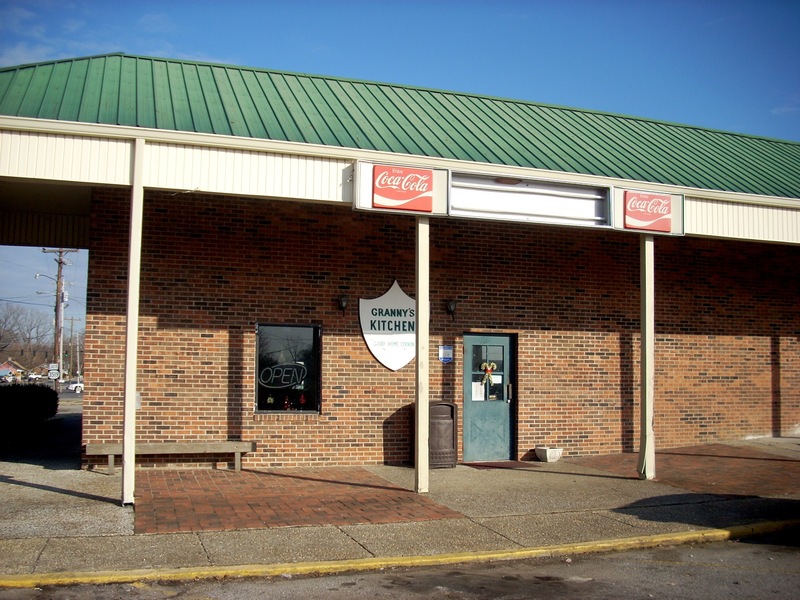 The main reason BG foilk drive to Russellville to eat is The Cattle Pen, located on Armory Drive (as you come into town turn right on Breathitt, which becomes Armory). Although it got off to a rocky start in 2008, service at this steak house has improved and it's pulling customers in from Logan and adjacent counties. The reason is their steaks. Owner Steven Kerr uses locally grown, certified Angus Beef steaks. The cattle are grass fed and get no growth hormone injections or steroids. They obviously are not frozen and shipped long distances so preservatives are not necessary. True steak conneisseurs can tell the difference in flavor and texture. They offer Sirloin, Ribeye, T-bone, and Filet in two sizes. Sides include Baked Potato, Broccoli, Rice Pilaf, Mashed Potatoes, Fries, Steamed Vegetables, Cole Slaw, the Salad Bar and Soup of the Day. They do offer chicken and seafood entrees, including Catfish grilled or fried and Salmon grilled, but so far those have not equalled their steaks. Customers complain the service is slow, but most of that is due to the kitchen taking its time on the steaks. Their Bully Burger, Western Philly Burger and Ribeye Sandwich are also worth the stop. The appearance of Granny's Kitchen is disorienting. This place needs to be in a little white cottage with flowers in the window boxes, or maybe in a farmhouse. Instead it's in a strip mall (Market Square) on 2nd Avenue in Russellville. Granny has her share of evening diners in for dinner, but honestly this is a better breakfast stop, where they're competitive with Bob Evans, Cracker Barrel and the other morning specialists. Atop the breakfast menu is the Biscuit section : Chicken Biscuits, Country Ham Biscuits, Pork Loin Biscuits, Bacon Biscuits, Sausage Biscuits, Egg Biscuits, and Egg and Cheese Biscuits. Along with the biscuits, you can get Sausage, Bacon, Tenderloin, City Ham, Country Ham, Country Fried Steak, or Ribeye. There's an Omelette Page : Steak & Cheese, Western, Meat & Cheese, Veggie, Ham & Cheese, Bacon & Cheese and Sausage & Cheese. And there's a Hashbrowns Page : Plain, Veggie, Meat, Mushroom, Cheese or Gravy. You can get a separate Gravy Bowl for your biscuits or a side of Grits. There's even a Kids Breakfast Menu where for $3.25 junior gets some combination of Bacon, Sausage, Egg, Toast, Biscuits,Gravy, Pancake and choice of Orange Juice, Milk or Hot Chocolate. If this place were in Bowling Green or Lexington there would be a line out the door every morning. This unassuming place is The Firehouse, on 2nd Street West across from the grain elevators. It has mostly a local following, especially of workers dropping by for breakfast on the way to work, for lunch on their break, and for dinner on the way home. 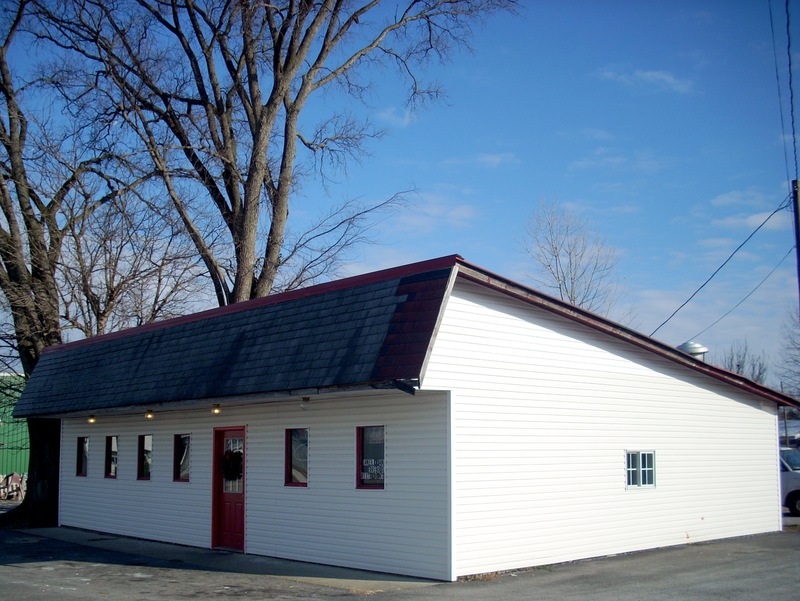 It offers inexpensive prices and a very traditional menu. Service is pretty snappy but of course that also means your food isn't receiving any extra attention back in the kitchen. The Air Conditioning comes and goes so you might want to avoid mid day stops in July or August. However, if you want a Country Fried Steak, Pork Chops or Fried Catfish at the best price in three counties, mixed in with lots of local characters discussing whatever's news in Russellville, this is your place.